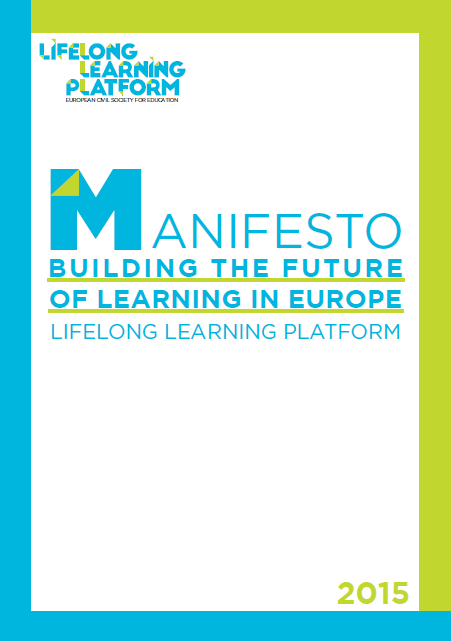 The Lifelong Learning Platform (until 2015 named European Civil Society Platform on Lifelong Learning) was born in 2005 as a response of civil society to new European policies in education and training. In the 2000’s, education was addressed for the first time as a subject of structured cooperation between the EU Member States. The importance of working across sectors and promoting a comprehensive approach to education was recognised both by civil society organisations and the EU. In 2001, several NGOs decided to join forces and share their experiences and expertise in order to contribute to the drafting of the European Memorandum on Lifelong Learning adopted by the European Union in 2002. A second initiative was launched in 2004 to raise awareness of the importance of basic skills as key competences for life. Those two initiatives were so successful that in 2004, six NGOs, AEGEE, EAEA, EfVET, EURO-WEA, EVTA and SOLIDAR, proposed to create and maintain a consultation platform open to all interested civil society actors in the field of education and training. In 2009, EUCIS-LLL was acknowledged by the European Commission as a “unique representation” of lifelong learning at EU level. It has also solidified its collaboration within members of the European Parliament and launched an Interest Group on lifelong learning! In 2015, the Lifelong Learning Platform celebrated its 10th Anniversary. We have changed our name from European Civil Society Platform on Lifelong Learning (EUCIS-LLL) to Lifelong Learning Platform, and have chosen a brand new visual identity. With a clearer name and a modern visual identity, we want to ensure our messages reach out as broadly as possible. The platform has grown and is proud to represent 42 European organisations, covering all actors in education – networks of parents, educators and teachers, schools heads and learners alike – and all sectors – higher education, primary and secondary education, VET, youth and even non-formal and adult education. Those organisations share a common vision of the importance of lifelong learning to build more democratic and sustainable societies. They try to answer the most urgent needs of our societies – such as adult literacy, early school leaving and tackling the increasing educational inequalities. We view education as a human right that should not only be offered in schools but throughout life and for all.